Finally we have been presented with a drop in the weather that I can actually take advantage of! Last Saturday forecasts predicted light morning breezes dropping out completely during the day. I had a plan to fish the flats and weedbeds early while conditions where still sloppy, and then head offshore to the shoals for the afternoon. A full day on the water, something we have not done in ages! This plan would also give the kids an opportunity to catch a few fish before Tania and I would take over with larger offshore outfits. We hit the Coast Guard ramp at about 5.45am to find one end completely blocked off. Why? For the race boats! Well, didn't this create complete mayhem for everyone. Cars were already queuing up out onto the main road, and parking on the grass was already taken. Time to get out of here and try Ross River. So we did an immediate u-turn and powered off to the other ramp. From what I heard later, trailers were parked as far away as The Strand. I wish we had been notified of this closure through social media, I would have made a completely different set of plans. Maybe head out of Morriseys to the South or Balgal to the North. When we arrived at the Ross River ramp it was already very busy, but at least there was parking still available. We did discover one issue though, as cars were queuing up at the entrance to the ramp area, boats launching at the older ramp couldn't get into the queue of cars to park their trailer. So it came to a stand-still for a while. But once we got through to the new ramp area we were in the water reasonably quickly and easily. Then it was just the slow 6knot trip to the front, made slower by everyone else wanting to do 4knots for some reason? Once clear of the 6knot limit we opened the throttle and headed south. As predicted the light morning breeze chopped up the bay a little, but it was still easy going running along the coast to our spot. On arrival the sounder light up with fish and we were soon into a good feed of Blue Salmon. But we only managed a half dozen or so before things went quiet. So I decided to try to run off the Cape. It was earlier than I wanted to, and I knew it was going to be bumpy. But with the knowledge of the weather dropping throughout the day I thought it would be a matter of sticking it out. As we neared the waters off Long Beach I decided to do a troll for some Doggie Mackerel. The water temp was well down and water looked great. It also gave a chance to slowly make our way to the cape without pounding in the choppy conditions. But with no strikes, I got bored very quickly. And after 30mins or so the line were in and we were off again. I headed straight for a set of marks only a short distance off the Cape. With the plan to slowly make our way wider toward the Mack Patches or 'Bunnings' as conditions improved. But we sounded around mark after mark with no fish or bait showing. It was sloppy and uncomfortable, and didn't look like improving. There was no way I was heading wider and it wasn't worth fishing here. Bugga, what now? Knowing it would be nice and calm in the Bay we headed back to our Salmon mark. By now it was almost lunchtime and it had completely glassed out in close. The fish had completely shut down and we needed to make a plan for the afternoon. So we ran to the channel markers in an attempt to chase some Macks around the pylons. But conditions in the channel were just too good. Yep, the wind had dropped out as predicted. We made our way to the North Cardinal and decided it was good enough to keep going and head wider to Maggie Shoals. We sounded around a few old marks and eventually found a patch of fish. Tania put down a metal slice for a Spaniard and I sent down a GIMP plastic for a Nannygai. And while we were consistently getting bites and fish, most of it was rubbish. The big Nanny's were not home. Time to go chase a Spanish Mackerel. My old faithful Spanish Mackerel spot wasn't too far away. This spot I found probably 15 years ago with Ward. It always produced for us. But the mark is now very well known and there were at least 6 to 8 boats trying to fish the spot. We nestled in under electric so as not to disturb other fishers. But lure after lure we pulled up Trevalley. Watching other boat it was looking like wall to wall Trevalley down there. Good fun, but getting expensive on lures when every second fish is taken by a Shark. We had spotted a couple of Whales breaching and playing in the distance, and Tania was keen to go take a closer look. We motored toward the Whales but couldn't locate them. But while slowing moving the boat around I got a nice show on the Humminbird. The electric quickly went down and the boat was locked over the lump on the bottom. My GIMP lure was immediately snaffled up by a 41cm Nannygai and Tania managed to pull one up on the metal slice. 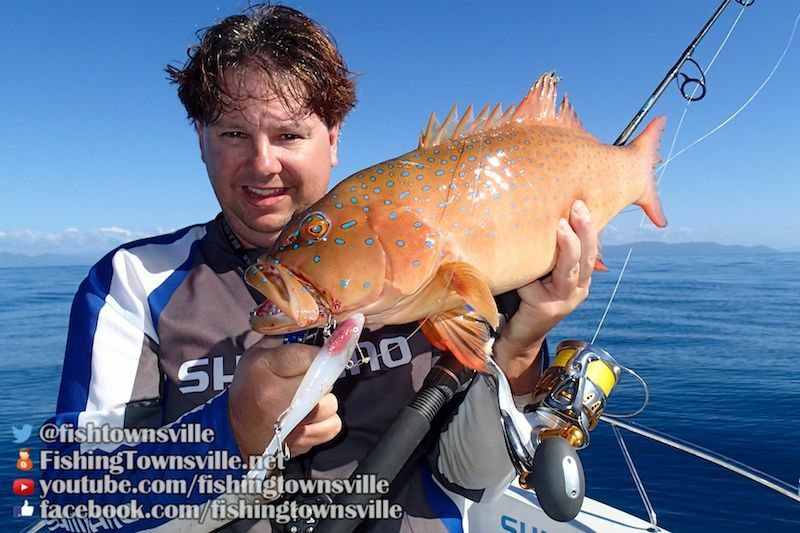 Unfortunately the bite didn't last long, but I did manage this lovely Coral Trout before things went quite. From here we made our way home. It was late in the afternoon, but still glassed out all the way in. Back at the ramp and the boats were queued up at the pontoons trying to get out. But everyone was patient and it didn't take long for everyone to do their thing and clear the area. What a great day on the water, if only we could get more of these conditions. GIMP soft plastic lure are perfect for these deeper offshore conditions. They are more heavily weighted and overall a bigger lure. Fished like any other soft vibe they will pull up all sorts for demersal species from 30m or more. GIMP lures are made locally in Townsville and available for purchase from The Fishing Warehouse. Get a handful in your tackle-box, and leave the stinky pillies home!